LED teeth whitening. Teeth whitening. how to get white teeth. cheapest teeth whitening. Cheap white teeth. Teeth whitening near me. 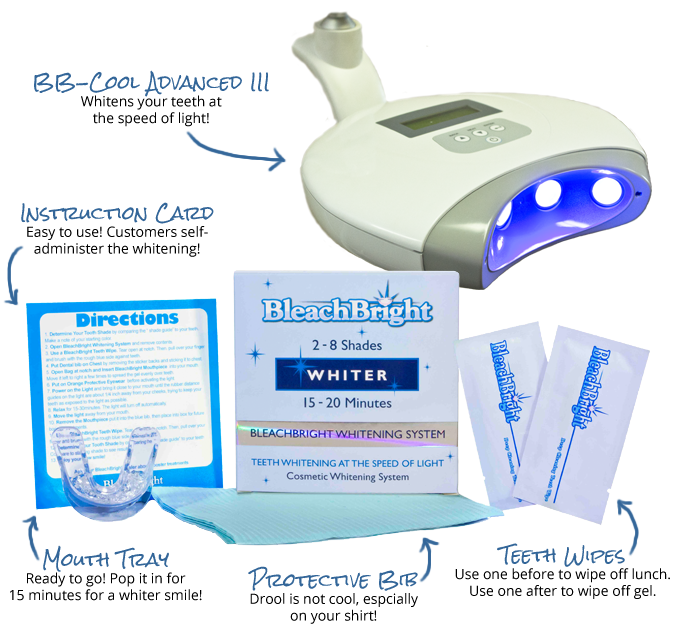 One system stands out above the rest for fast and effective teeth whitening: the BleachBright L.E.D. Whitening Kit and BB-Cool Advanced III light. Popular in salons, spas, and dental offices all over the world, the BleachBright system combines speed and convenience with amazing results. Bluminerals™ enamel boosting gel seals in your whitened teeth and protects them against future stains. With just a 10-minute treatment, sitting under an L.E.D. light, you can increase your enamel strength and protect your teeth against damage and yellowing. Think of bluminerals™ as the finishing, protective touch for your brilliant new smile. You wouldn’t wash your car without waxing it, would you? And you wouldn’t shampoo your hair without applying a hydrating conditioner, right? Well, don’t leave your newly whitened teeth unprotected, either. After you whiten, insure your smile with bluminerals™ by BleachBright! In just one session, you’ll see your teeth lighten 2-8 shades!